The massive crackdown on the internet’s festering white supremacist contingent claimed another victory last night: Stormfront. The neo-Nazi forum has a much longer and deadlier history than more recent sites like the Daily Stormer or The Right Stuff, with Holocaust denial posts from the site’s founder Don Black appearing on USENET newsgroups as early as 1985. 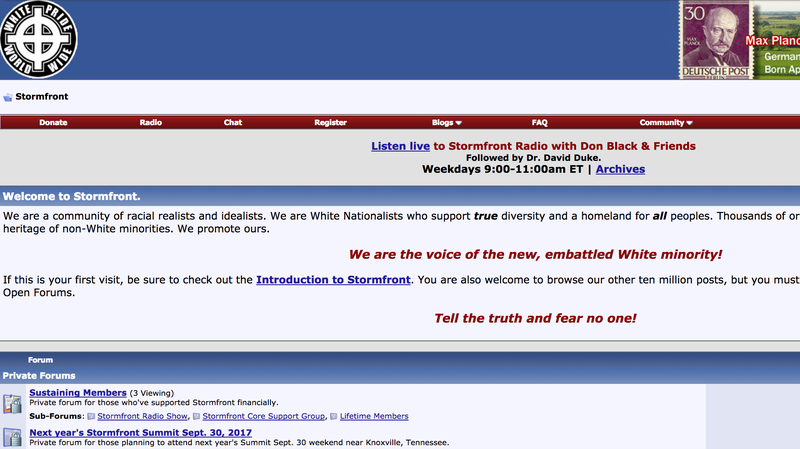 Stormfront grew out of those pre-internet newsgroups—like alt.skinheads, alt.revisionism, alt.politics.nationalism.white—eventually becoming a standalone site whose members have been directly linked to almost 100 bias-related murders. Attempts at purpose-built white nationalist sites were made prior to Stormfront, but it was the first to gain traction. Before going dark, the long-running site drew close to half a million unique monthly visitors, according to Alexa data. Black, a former Ku Klux Klan Grand Wizard, learned the skills to build Stormfront during his three years in federal prison, which he served for attempting a violent overthrow of Dominica, an island just north of Martinique. The New York Times reports that “Nazi and Confederate flags, dynamite and 30 high-powered rifles” were among the items found by authorities when he and nine other men were caught. Currently, a Whois search shows that Stormfront.org’s domain provider—Network Solutions LLC, a company under Web.com—has placed a hold on the site. The Knoxville News Sentinel reports that the closure comes at the behest of the Lawyers’ Committee for Civil Rights Under Law, which drafted a letter to Web.com’s CEO pointing out that, after more than 20 years, Stormfront was in clear violation of his company’s acceptable use policies. Gizmodo has reached out to Web.com but has not yet received a comment. The Net is opening up new terrain in our collective consciousness, between old-fashioned “news” and what used to be called the grapevine – rumor, gossip, word of mouth. As Black’s own posts reveal, neo-Nazis sought to dismantle multiculturalism by inventing narratives back then too—only the immigrants they blamed for society’s problems came from elsewhere. I came to a conclusion in early 1996 that there were inherent flaws in the philosophy advocated by the so-called “movement,” as well as glaring problems with the “leadership” of this “movement.” The caustic traits attributed to the Jews by the key leaders of the “movement” were actually reflections of their own personalities: self-aggrandizing, delusive, selfish, base personalities which didn’t actually ascribe to a genuine higher purpose. That 30,000 customers felt unmanageable makes the prospect of clamping down on networks with millions upon millions of users that much more daunting. Ideally, we could close this chapter of internet-enabled hatred for good, but in all likeliness Stormfront will do what the Daily Stormer has been doing for weeks now: hopping between domains, providers, and hosts; ping ponging between the dark net and the clear web. For now, however, Stormfront’s jettison serves as a strong symbolic victory.